While Louis Riel was leading his provisional government and negotiating with the Canadian government over the Red River valley territory, there was a group of Canadian expansionists who opposed any guarantees for Métis rights in the area. At one point, they attempted to attack Fort Garry and several were arrested. Riel let most of them go on the condition that they promise to leave the valley or obey his government. 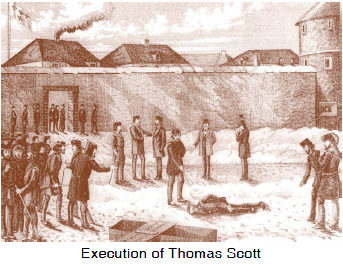 Among those who refused and remained in prison was Thomas Scott, an Irish Protestant. Scott was an Orangeman and very anti-Catholic. He repeatedly taunted his captors and threatened to kill Riel. A Métis court voted to execute Scott and Riel went along with their decision. Some historians say this was one of Riel's most fatal errors. Scott became a martyr for that faction of Canadians who were anti-French and anti-Catholic. Riel had to flee to the United States and although he was never charged with Scott's murder, many feel that Riel's own execution after the Northwest Rebellion of 1885 was really retaliation for the incident with Thomas Scott.